Palmetto Linen Blog: Who Buys Bed Linen Wholesale? Who Buys Bed Linen Wholesale? There are several types of businesses seeking bed linen for wholesale prices to save money. Hotels, motels, and bed-and-breakfast establishments need large quantities of plain white flat or fitted sheets and pillowcases to change bedding on a daily basis to meet cleanliness standards. White cotton percale or microfiber bedding is preferred by the hospitality industry because the material is easy to wash at hot temperatures in washing machines to destroy pathogens before drying quickly in a hot dryer. These fabrics are often crisp and free of wrinkles when removed from a dryer, but it is also possible for laundry workers to press or iron the items. Another industry that needs numerous sheets and pillowcases is medical facilities such as rehabilitation centers, assisted living homes, and hospitals. The bedding in medical establishments requires frequent changing to prevent infection from a patient’s body fluids, leading to needing durable microfiber and cotton percale sheets in twin mattress sizes. The ability to order bedding in bulk for medical facilities is vital to saving time for busy hospital management who must ensure there are enough pillowcases and sheets to meet the needs of patients. Many patients also require soft bedding to avoid additional health problems caused by abrasions against the skin after injuries occur or undergoing surgical procedures. 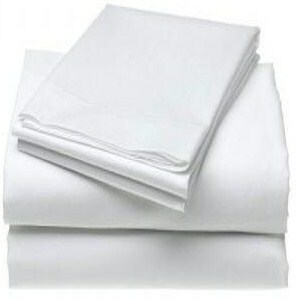 Bed linen for wholesale prices is also required by spas, cruise ships, and emergency shelters. A spa needs specialty sizes of flat or fitted massage table sheets that feel luxurious against the skin of clients. This bedding must launder nicely in hot water to remove emollients such as lotions and oils used during the massaging sessions. Cruise ships must have an assortment of sizes of sheets to meet the needs of guests staying in small or large cabins. Emergency shelters such as foster care facilities require numerous pillowcases and sheets for children needing services. The sheets and pillowcases are labeled with sizes, making it easier to sort and fold the items and sold in quantities of two dozen or more per package.